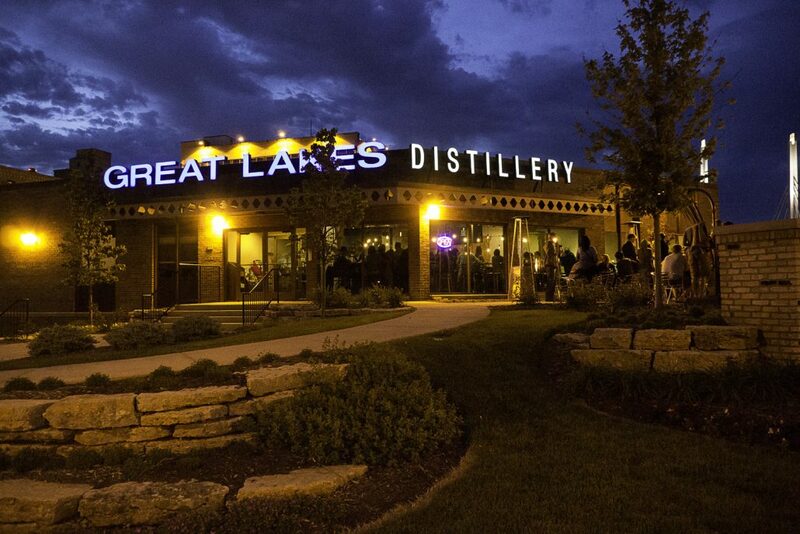 You might be familiar with this featured venue as a producer of fine, hand-crafted distilled spirits, but Great Lakes Distillery, located in the trendy Walker’s Point neighborhood, is also the perfect spot for your next private event! Founded in 2004, Great Lakes Distillery has secured its place as a well-known Milwaukee institution winning numerous awards for their craft, as well as being prominently featured at many local restaurants and at Miller Park for every Milwaukee Brewers game. With a variety of service options and spaces at their facility in Walker’s Point, Great Lakes Distillery makes a convenient and happening spot for your next social celebration, corporate event, graduation party, or intimate wedding reception. Their impressive Tasting Room, situated around a large circular bar, complete with their entire selection of craft spirits, can accommodate up to 70-seated guests and 120 standing. Here, you’ll find the perfect spot for a cocktail party, birthday celebration or corporate happy hour. Great Lakes Distillery also features a beautifully landscaped outdoor patio offering exceptional views of the Downtown Milwaukee Skyline and vibrant surrounding neighborhood. This gorgeous outdoor space can comfortably accommodate up to 65 guests and is perfect for a summer picnic, intimate outdoor reception, or social soirée. Saz’s Catering proudly features Great Lakes Distillery spirits in many of our premium cocktail menus and we’re thrilled to be a preferred caterer at such a fantastic space. We can work with you to create a menu perfect for any celebration, complete with the exceptional service and hospitality that we’re known for. Learn more about Great Lakes Distillery at their website, then contact Audrey King at 414.431.8683, extension 111.
next post: Urban Harvest Brewing Co.